Israeli couscous looks like little pearls, and it’s made from semolina or wheat flour. It has a slightly chewy texture, similar to barley, and because it is toasted, it has a slightly savory flavor. This dish makes getting dinner served quick and easy by grilling your veggies along with your chicken, steak, pork or fish, and only 12 minutes for your couscous to cook. A great accompaniment that is simple and easy for a busy weeknight or a relaxing weekend. Feel free to change-up the veggies to what you have on hand or to your families liking. Enjoy! Heat the 2 tablespoons olive oil in a medium saucepan over medium heat. Add the couscous and toast until golden brown. Add 1-1/2 cups water, bring to a boil, then reduce heat to low and simmer until all of the liquid is absorbed, about 12 minutes. Fluff with a fork to separate the grains. Set aside. Prepare a grill for medium heat. Toss the zucchini and peppers with the oil and some salt and pepper. Grill the vegetables, flipping occasionally, until just tender and lightly charred, about 20 minutes. Remove from the grill and when cool enough to handle, cut into 1-inch pieces. 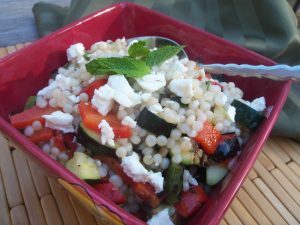 Mix the grilled vegetables together with the couscous. In a bowl, whisk together the lemon juice and the remaining 3 tablespoons olive oil. Toss the lemon vinaigrette, feta and mint with the couscous salad. Mix well and season with salt and pepper to taste.